The Apple Watch has been out for just under a month, but already it’s had a major impact on my life. Specifically, it’s significantly increased the amount of time I spend waiting for apps to install on my iPhone. Yes, since early April, my phone has been inundated with updates. It seems every goddamned app has a new version which includes a watch extension.1 If you use an iPhone, you’ve likely seen a similar parade of updates in recent weeks, whether you bought a watch or not. Having purchased an Apple Watch, these updates have the potential to be useful to me.2 However, I’ve found my usage of the watch largely constrained to the included Apple apps. 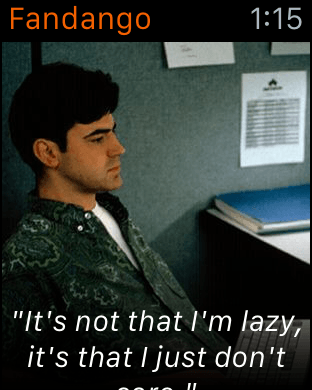 Third-party applications are often slow to load, which can be frustrating. Worse, they’re also extremely limited in their abilities at present. My friend Cabel Sasser has done fantastic work in showing exactly what the Fandango watch app can do. If you install only the Fandango app itself, launching it will provide you with a random quote from a movie, along with a still frame. If you turn on the app’s “glance” as well, you’ll literally double the number of things this app can do. The Fandango glance acts as a sort of trivia host, showing you an extremely limited set of “Guess the movie character from a quote” cards. If I’m not mistaken, there are a grand total of 28 quotes currently. I…I don’t have much money in my checking account. USAA is a great company, and if you have the ability to use them for banking, insurance, or just about anything else, you should. 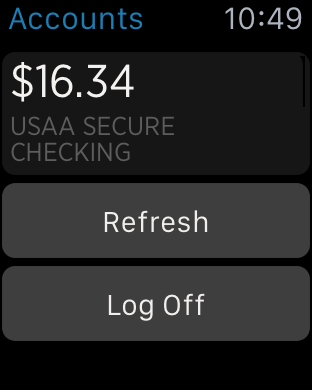 The USAA Apple Watch app, however, is utterly pathetic. You’re looking at the entirety of the app’s functionality. After logging in with a PIN, the app displays my checking account balance, and provides me with two options. If I’m done staring at my balance, I can tap “Log Off”, which will helpfully take me back to the screen asking for my PIN. Ah, but what if I think that the balance in my account may have changed, or even if I’m just hoping for a second opinion? Then I can tap “Refresh”. Excellent! Don’t lie to a flowchart. If you’re thinking of designing a watch app, think twice, because your intended app may be no good on this platform.